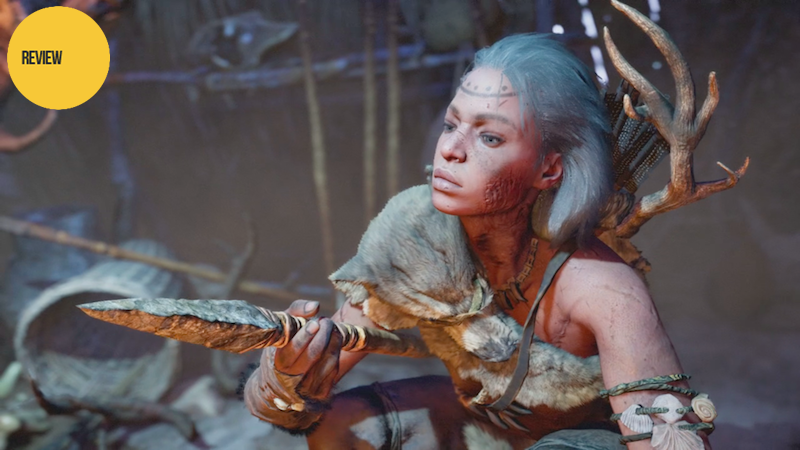 Far Cry Primal is frequently violent and occasionally, unexpectedly sweet. The caveman action game is an excellent concept best experienced by people who haven’t been playing every entry in Far Cry, another of gaming’s perpetual franchises. It’s an iteration. It’s a tweak. It’s another reprise of 2012's Far Cry 3 formula of first-person open-world hunting and base-raiding and character-leveling, this time with the grappling hook added by 2014's Far Cry 4. It’s that familiar equation minus the guns and grenades, although many of those weapons’ functions are covered by Primal’s bows, zooming bows and double-arrow-firing bows, bee bombs and fire-bombs. You play as a caveman named Takkar. You’re tasked with going on major and minor missions throughout a lush, open environment, usually with the goal of taking out enemy factions. There are experience points to be gained, outposts to be cleared, and skills to be learned on a many-branched skill tree. Those of us who thoroughly played FC3 and FC4 have thoroughly climbed this tree before. It is hard to muster up excitement for enemy-tagging and chain takedowns the third time around. If you’ve missed a Far Cry in recent years, then you’re lucky, because it’ll make Far Cry Primal feel less like you’re having for dinner what you just had for lunch. Many game series repeat themselves, but usually at least benefit from the improvements of iteration. But Far Cry 3's creators crafted such a smooth-playing, satisfying shooter in 2012 that their subsequent sequels have improved but just marginally, switching locales from tropical jungle to Himalayan forest to, now, Stone Age forest. Until now the series has also been limited in its available actions: kill, kill quietly, drive, and kill by driving. Here, though, is where Far Cry Primal has found something new to do beyond reinventing the wheel. It gives the series two newly available verbs: tame and pet. The petting is the subtler addition. It serves no gameplay purpose to pet the animals you tame. You gain no XP for massaging the scruff of a jaguar’s neck or the brow of a dog-like dhole. You simply can, and in doing so participate in the most exotic addition to a Far Cry game in ages: an interactive action of kindness. Far Cry games embody the default hostility imbued in so many game worlds. We are in a lot of them to kill or be killed. The buttons on our controllers seldom start jokes, make friends or de-escalate a deadly fight to a diplomatic handshake. Violence is the easiest interactive action to design and perform. To press a button to perform any nice action in a series such as this is a quiet revelation. Despite its more brutal setting, its warring cavemen factions, its ear trophies and blood-drinking shaman character, Primal somehow manages to be the kindest Far Cry yet. It is still a bloody game, but in a way that strains the story less. Takkar makes sense as a killing machine far more naturally than Jason or Ajay from Far Crys 3 and 4. He’s a caveman living in rough times. He’s also, though, a man who pets his pet bear and who is building a village. Being kind to your animals in this game means not letting them get trampled by a rampaging mammoth. Whoops! Primal’s base of operations is a slowly reconstituted village, a community of fellow Wenja tribespeople that swells in population as you play. As you kill enemy men and women and as you skin fierce animals for their hides, you are able to move people into your village, build them huts and learn their stories. You kill in the name of building your community, and you might just be able to get some of your enemies to move in as well. Your new neighbors lead to the game’s seven lines of quests that prove to be as fundamental to your progression as killing the game’s two major villains. One sidequest-giver teaches you to hunt. Another takes you on vision quests. The most compelling, a brute named Dah, complains of “skull fire” and earnestly beseeches you to help him as his head throbs from a Stone Age migraine. His is the most touching story in the game, the first in any Far Cry for which I’d use that adjective. The game is mostly action, but its quests show a series primed for greater thematic complexity. You’ll spend more time using a pet owl as a prehistoric predator drone and sending in a stealth jaguar to kill your enemies, but you can also take a side mission to figure out why your village’s water source is making people sick or another to protect the people in your tribe who want to go out at night to sing to the spirits. Many of Far Cry Primal’s best missions are well-hidden and not pushed upon the player. This dynamic is a slight echo of its predecessors, which tucked some of its most interesting locations off its main path. One of the game’s low-key highlights is the batch of optional cave missions, each of which blocks Takkar off from his pet animal and challenges you to escape some of the most beautiful, enclosed locations of the game. The Drowned Cave, one of the the game’s cooler remote locations. Much of the game, enjoyable as it is, feels like a retread, but the late game brings more fresh ideas. Primal’s alluring animal hunts build toward optional side missions each located in a large corner pocket of the map, each involving the hunt for a high-powered beast: an uber bear, mastodon and so on. These exceptional hunts work as free-roaming boss battles. In one hunt set in the southwestern corner of the map, players set traps for an unusually vicious saber-toothed tiger by day and then ambush the enemy creature at night, chasing it back to its lair if it flees. More than anything, these encounters are a resuscitation of the underexplored boss battle sandbox design of games like Metal Gear Solid 3. The best parts of Far Cry Primal may be well-hidden, but the core is good, too. The running, the climbing, the sneaking and the shooting all feel as good as they ever have. For some, doing all that again but against cavemen and woolly mammoths will provide sufficient novelty. 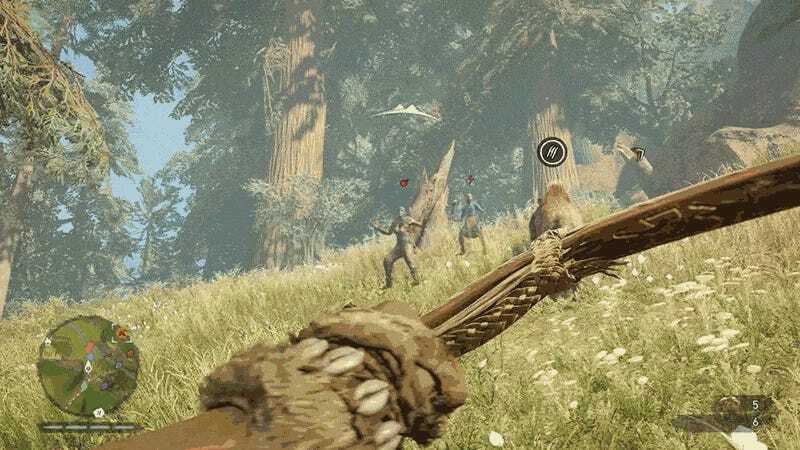 More subtly, the game’s moments of kindness and community-building and those extended hunting sequences show the flint sparks of an evolutionary step to come. Primal is worth playing, but only once you’re hungry for more and only if you’re prepared to plumb its depths.